In the UK the yogurt council launched for the first time Yogurt week during May. This was to bring awareness to the public about the health benefits of yogurt. Yogurt is one of my favourite ingredients and I use it daily in a lot of my cooking. The yogurt council have announced a competition to create and style a yogurt recipe I am very excited to enter. This is my entry for #yogurtstylist competition hosted by yogurt council. Jelly is commonly known in the west and I am sure that everyone must have eaten it at some stage or other in their lifetime. On the other hand you may not have heard of Shrikand. This is an Indian sweet that accompanies a Gujarati thali in any traditional Gujarati meal. 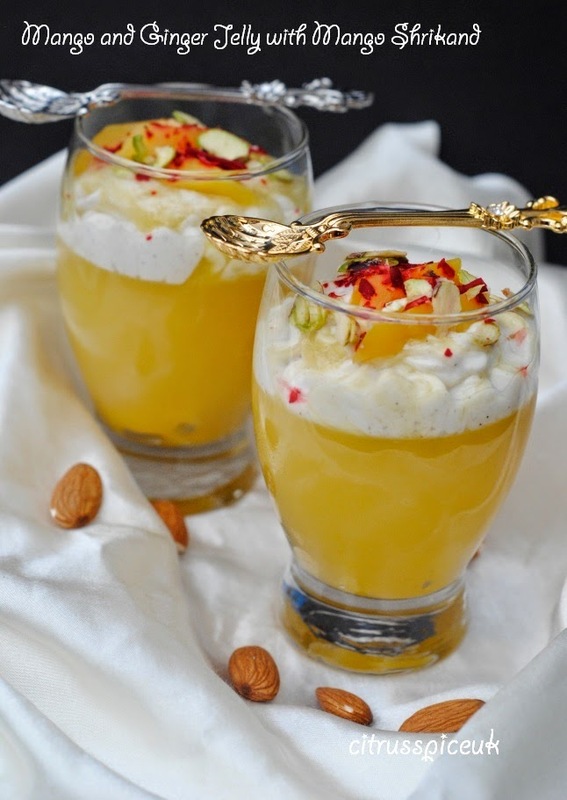 Shrikand is prepared with hung yogurt that is sweetened with sugar and flavoured with cardamom, nuts and fruits and served as an accompaniment to a main meal. It's rich and creamy taste helps to counter act the spiciness of the curries that are served in a thali. 1. Line a colander with a muslin cloth and pour the Greek yogurt into it. Gently bring the corners of the cloth together and twist them. Place the colander in a large bowl to catch any water drips from the yogurt and leave it aside for 3-4 hours. 2. After 4 hours, open the muslin cloth and scoop out all the yogurt and place it in a bowl. (This is called hung yogurt) Discard the water that has dripped from the yogurt. 3. To the yogurt add the icing sugar and cardamom and fold the sugar in to the yogurt. Once all the sugar has been folded in the yoghurt place the Shrikand in the fridge to chill. 4. Place the mango in a blender and purée it until its smooth. Transfer the mango purée to another bowl and chill in the fridge. 5. Place the water and agar agar and the ginger into a large saucepan and simmer the water until the agar agar is totally dissolved.Remove the ginger and discard. 6. Reserve 1/3 of the mango pieces and keep them to one side. 7. Place the remaining mango pieces in to a blender jug with the sugar and purée the mango until its smooth. 8. Add the puréed mango to the pan with the agar agar mixture and simmer for 3-4 minutes until agar agar is totally dissolved. 10. Add a few pieces of mango in each serving glass and pour the jelly into 4 serving glasses, filling them two thirds full. too. Leave the jelly to cool and when it reaches room temperature place the serving glasses in the fridge to chill and set. 11. Once jelly is set remove serving glasses from fridge and place them on the table . 12. Take the yoghurt Shrikand and mango purée out of the fridge. 13. Into the yogurt Shrikand add 3 tablespoons of purée, gently fold the purée into the Srikand forming a ripple effect.Do not over mix. 14 Spoon the mango Shrikand on top on the glasses filled with ginger mango jelly. they look and sound amazing.... my mother-in-law loves puddings like this... will be saving to try when they are over. Thank you for sharing. I hope you try it your mother in law will love it. Your recipe looks amazing, even I can follow it and I'm not into cooking at all. I've not heard of Shrikand before, I'd love to try it. I do love yoghurt though but don't know much about its benefits. 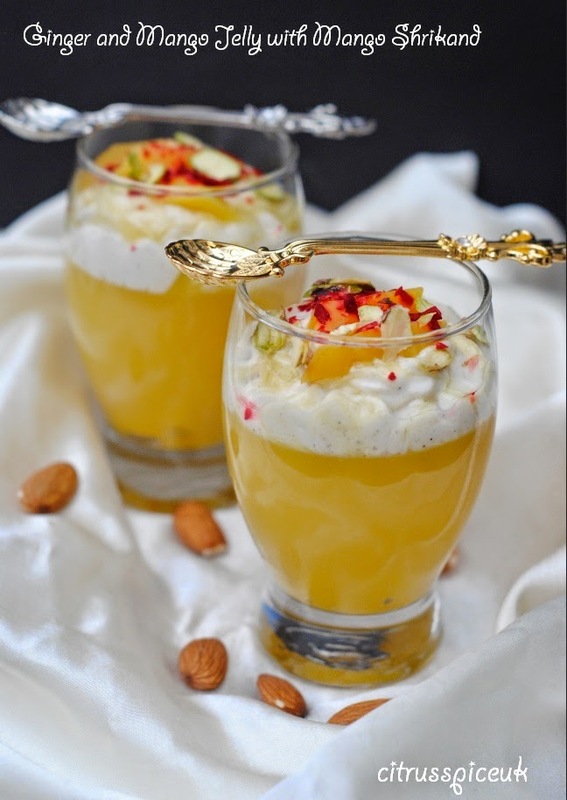 Thanks for sharing with us a recipe that combines the health benefits of mangoes, Greek yogurt and almonds all together. All three ingredients make super combination don't you agree?? What a lovely sounding recipe! Best of luck in the competition! Very innovative and nice dessert.. I usually don't eat desserts but love this combo. Thanks Shobha, I hope I have changed you mind. This looks like a perfect summer's dessert. Looks amazing. As usual great pictures. Ok I have to try this! :) This looks amazing and your photography skills are top notch! Oh N, I seriously want to bury my face in this dessert. That looks heavenly Nayna. I haven't tried agar agar yet, so I shall be looking to you for tips. that sounds and looks so delicious! You can leave the ginger out and make plain mango jelly instead. You can leave the ginger out. I hope you try making them Lisa. You will not be disappointed. This does look delicious but I don't think I'd ever manage to make it! I absolutely love mango...will have to try this as it looks and sounds delicious! I hope you try it Fozia. they look amazing, I am suddenly starving! These look amazing. I'm so lazy, I focus on really basic desserts that don't need setting time! But its worth the wait as it is so delicious. sounds delicious, refreshing but also a little indulgent too! But desserts need to be naughty!! Don't you agree?? Oh yummy - thank you for sharing. That looks so pretty, and slightly unusual too. Love your photos! That looks and sounds delicious, love the styling of your photographs. That sounds lovely. I love anything with ginger in it and would never have thought to pair it with jelly. Great idea! I love ginger and mango too. Those look really elegant and mango and ginger are lovely flavours. oh my goodness this look so good! I will certainly be trying to have a go making one of these this weekend! Nom! Oh this looks lovely! I'm not a big mango fan but I love ginger - maybe this is enough to make me try mango again! Coming here second time and I must say I love the recipe. Those spoons look great too! nice fusion and lovely clicks.